My worksites (in a time before LandWorks) were no different, men happily losing then finding hammers, all day long! Ah! This was difficult, new and uncomfortable. Only happened once. The hammer turned up; our new man totally trustworthy. Some time ago, while trying to get LandWorks off the ground, I wanted to warn folks about jumping to the wrong conclusions. So, I tried to recreate this formative memory at a ‘get the community onboard’ meeting at Dartington Hall. Apparently this was not comparable to a simple hammer. Oh no! For it’s a very precious; much loved and, on a practical note, an extremely heavy work of art, to mislay or even nick! My story fell flat. But this is an important theme for our guys, to feel trusted. We work hard at trying to do this. Encouraging responsibility and an honest approach, it takes time; the first few months at LandWorks can be quite an eye opener for new trainees. 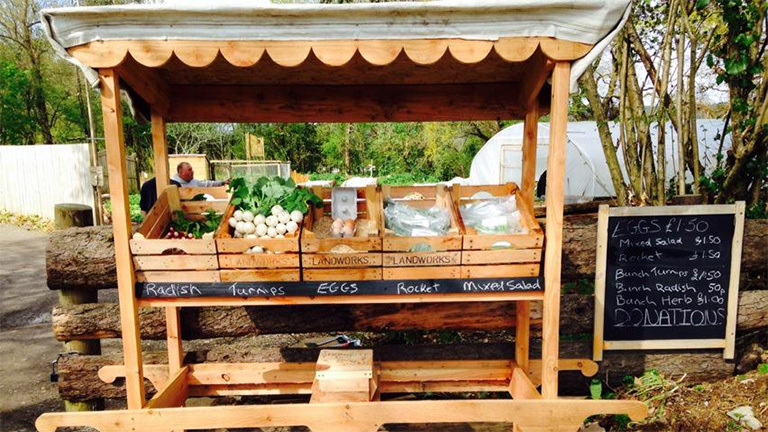 We are about to launch our beautiful new wooden market stall, providing an array of delicious fresh LandWorks veg. Available at our field gate, veg cut daily and all funds going back into the project. The aforementioned funds to be deposited at the point of sale, into our new honesty box…yes, honesty box! “Chris lad, I can’t believe you’re doing this…it’s going to get nicked”. I think all the guys have, one way or another, registered their concerns and general unhappiness about my simplistic view. Begrudgingly Jerry growled… “Everyone knows I’m an offender and I was, but me and the lads ‘ave also been the victims, many times. People don’t think about that, trust ain’t easy Chris”. We open first week of May! Yeh- this is ok and sounds pretty funny and normal. I like the idea of everyone getting some experience at growing their own food – this has got to be especially helpful to people who are in marginalised situation trying to get buy with little money in a cash economy. Thanks for getting in touch Chris. You’re right – there’s something really therapeutic and powerful about veg growing, especially when it can then be sold to plough funds back into the project. Gives an important sense of purpose and encourages responsibility. Thanks also for your suggestion and offer to help. We’ll get in touch with you direct.